Just to give you an impression: This is pretty much what it will look like inside the cameravan when it is finished. A little more tidying will probably be done. In addition I will make a movable screen that is smaller and can be used for other types of photography. Madison from Ian Ruhter : Alchemist on Vimeo. … and almost ready for painting. The image screen, made of paper just for testing and demonstrations. The plan now is to do some small work to cover all light leaks. The roller curtains wan’t let any light through, so I just need to make some light traps around them. A little work to lightproof the skylights is also needed. Then there is some painting to be done. The camera has to be black inside, all over. 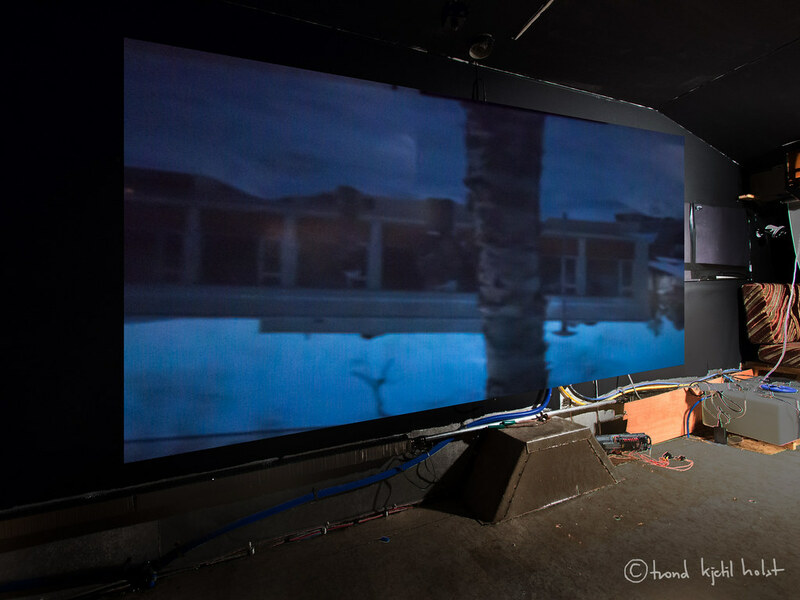 This is the very first image projection inside the camera (camper). I put up a large paper screen on the wall, and have made a small hole on the opposite wall. The image was captured with an Olympus OM-D E-M5 digital camera, 4 seconds exposure at f.4, iso 6400. Lens Panasonic 7-14mm. Digicam placed a little below the hole inside the pinhole camera. The aperture opening of the pinhole camera is approx f:200, distance between hole and screen a little more than two meters. It seems to work out pretty well this far. Now I need to clean up a little, cover every small light leak, paint it black inside and make a more permanent image screen inside.